All right everyone, a special live thread tonight for those of you who'll be watching the Lakers/Celtics game. 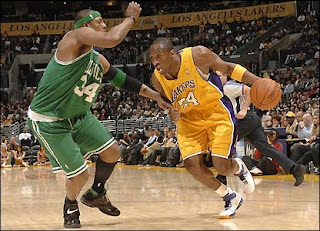 Kobe is coming off of 61 and 36 point games after Andrew Bynum went down, while the C's have won 12 straight. With this game being in the Garden - by which I mean the TD Bank North American Leprechaun Arena, or whatever the hell they call it - and Bynum being out, I wouldn't exactly say I like the Lakers. And neither does FanIQ. 69% of you say the Celtics are going to win. But then again, Kobe is probably the best player in the league, so you never know what could happen. Feel free to chat it up here, or on the already seriously active game page. Also, if you're interested, stick around for game two which features Dallas versus Utah. You'll probably see more white guys on the court in that game then you will the rest of the season.